The Summer Reading Program starts this week with the theme of “Escape the Ordinary” for the adults and “Every Hero has a Story” for the youth. I love to escape by reading, and have been doing it ever since I could open a book. And over the years and within those pages I found a little orphaned red-haired girl whom I am so happy to share a name with. I went through three copies of Anne of Green Gables by the time I was twelve, and also went through a phase where I bought everything Anne, from the Anne of Green Gables cookbook to the Anne of Green Gables doll. And then the movie came out! I was in Prince Edward Island heaven! And Anne! She was my “kindred spirit,” my imperfect yet big-hearted friend, a strong-willed happy girl who made her own destiny. She was inquisitive and passionate, sought out her dreams and lived life on her own terms – with compassion and hard work. She did have a temper, and that got her into a few scrapes (breaking her slate on Gilbert’s head! ), but she also had a very good head on those shoulders and was able to learn from those scrapes. Anne was different, and though she tried to fit in, she was always her own person – aware of what her happiness was and how she could foster it. 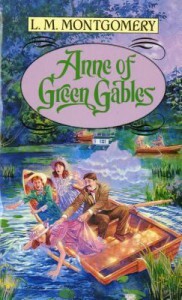 Lucy Maud Montgomery, Anne’s creator, went through a rather difficult time prior to the writing of Anne of Green Gables. She had a failed engagement, the death of her neglectful father, was living with her crotchety grandmother, and housebound due to the coldest winter Prince Edward Island had ever seen. However, as she wrote in her journal in 1908, “Thank God, I can keep the shadows of my life out of my work. I would not wish to darken any other life – I want instead to be a messenger of optimism and sunshine.” And what better messenger than Anne. For more uplifting coming of age classics, or perhaps you just need to revisit those girl heroines who shaped your life, please take a look at the following literary heroes (Anne, Betsy Warrington Ray, Laura Ingalls Wilder, and Mary Lennox) in my reading list.